Located in the former bachelor's quarters of a 19th-century U.S. Calvary post, at one of Yellowstone's most famous visitor centers, the Albright museum provides a retrospective view of American mountain life. 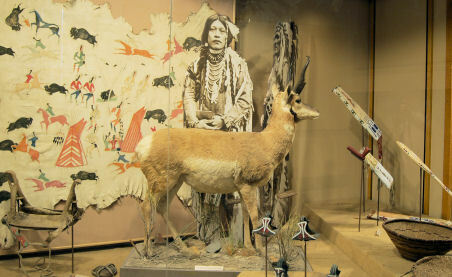 Its exhibits on Native American history, American mountain pioneers and the exploration and founding of the country's first national park each tell a separate story about the history and significance of Yellowstone. The second floor exhibits highlight Yellowstone's natural history. There is also a short video on the evolution of the national park concept. Complementing the exhibits are two separate art galleries. The Moran Gallery highlights the detailed works of watercolorist Thomas "Yellowstone" Moran, who visited Yellowstone as a member of the Hayden expedition in 1871. His meticulous drawings and paintings became synonymous with the awe often equated with Yellowstone's beauty - thus his affectionate nickname. Moran's diary from the exhibit is also available for viewing and provides a glimpse into the genius of one of America's most respected landscape artists. The Jackson Gallery exhibits the photographs of Henry Jackson, who also accompanied the expedition in 1871. Although he was recognized both for his photography and his colorful and painstaking depictions of early western life, Jackson was an impassioned photographer. His photographs are credited with helping to solidify support for Congress's dedication of Yellowstone National Park. The museum also features a Yellowstone National Park Association bookstore. The Mammoth Springs (Albright) Visitor Center and museum are open year round. Seasonal hours: Year round; late August-late May 9:00 a.m. to 5:00 p.m.; Late May - late August 8:00 a.m. to 7:00 p.m. Accommodations available: Hotel and campground available. Norris Geyser Basin (21 miles south) has a campground and Tower Roosevelt (18 miles east) has a lodge, cabins and campground.